Feast your eyes on this glamourous twosome of eye shadows featuring maxed out pigment and molten metallic sheen. Each duo contains a sparkle and coordinating metallic shade. The artisanal blend of glitter and shimmering metallic pearls play with light to create shape-shifting, supernatural dimension. 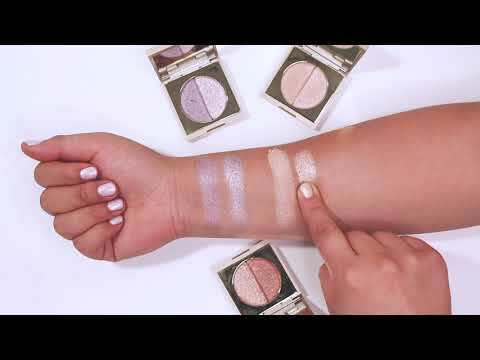 Create the perfect neutral eye look with a burst of sparkle and metallic sheen. Kitten Metallic - INGREDIENTS/INGRÉDIENTS: MICA (CI 77019), ZINC STEARATE, OCTYLDODECYL STEAROYL STEARATE, HYDROGENATED POLYCYCLOPENTADIENE, CAPRYLIC/CAPRIC TRIGLYCERIDE, DIMETHICONE, TALC, CALCIUM ALUMINUM BOROSILICATE, HYDROGENATED PALM KERNEL GLYCERIDES, ISODODECANE, SILICA, CAPRYLYL GLYCOL, ETHYLHEXYLGLYCERIN, HYDROGENATED PALM GLYCERIDES, TIN OXIDE, TOCOPHEROL, CALCIUM SODIUM BOROSILICATE. (+/-) TITANIUM DIOXIDE (CI 77891), IRON OXIDES (CI 77491). Kitten Glitter - INGREDIENTS/INGRÉDIENTS: POLYETHYLENE TEREPHTHALATE, MICA (CI 77019), SQUALANE, SYNTHETIC FLUORPHLOGOPITE, CALCIUM SODIUM BOROSILICATE, SILICA, POLYURETHANE-11, HYDROGENATED STYRENE/ISOPRENE COPOLYMER, TALC, CAPRYLYL GLYCOL, ETHYLHEXYLGLYCERIN, TIN OXIDE, GLASS BEADS, CALCIUM ALUMINUM BOROSILICATE, TRIS-BHT MESITYLENE. (+/-) TITANIUM DIOXIDE (CI 77891), IRON OXIDES (CI 77491), YELLOW 5 LAKE (CI 19140), CARMINE (CI 75470), ALUMINUM POWDER (CI 77000). *CONTAINS CARMINE AS A COLOR ADDITIVE./CONTIENT DU CARMIN COMME ADDITIF DE COULEUR. Golden Topaz Metallic - INGREDIENTS/INGRÉDIENTS:MICA (CI 77019), CALCIUM ALUMINUM BOROSILICATE, ZINC STEARATE, OCTYLDODECYL STEAROYL STEARATE, TALC, HYDROGENATED POLYCYCLOPENTADIENE, CAPRYLIC/CAPRIC TRIGLYCERIDE, DIMETHICONE, HYDROGENATED PALM KERNEL GLYCERIDES, ISODODECANE, CAPRYLYL GLYCOL, ETHYLHEXYLGLYCERIN, HYDROGENATED PALM GLYCERIDES, TIN OXIDE, TOCOPHEROL, CALCIUM SODIUM BOROSILICATE, SILICA. (+/-) TITANIUM DIOXIDE (CI 77891), IRON OXIDES (CI 77491), YELLOW 5 LAKE (CI 19140), ULTRAMARINES (CI 77007), CARMINE (CI 75470). *CONTAINS CARMINE AS A COLOR ADDITIVE/CONTIENT DU CARMIN COMME ADDITIF DE COULEUR. Golden Topaz Glitter - INGREDIENTS/INGRÉDIENTS: POLYETHYLENE TEREPHTHALATE, MICA (CI 77019), SQUALANE, SYNTHETIC FLUORPHLOGOPITE, CALCIUM SODIUM BOROSILICATE, SILICA, POLYURETHANE-11, HYDROGENATED STYRENE/ISOPRENE COPOLYMER, TALC, CAPRYLYL GLYCOL, ETHYLHEXYLGLYCERIN, TIN OXIDE, GLASS BEADS, CALCIUM ALUMINUM BOROSILICATE, TOCOPHEROL, TRIS-BHT MESITYLENE. (+/-) TITANIUM DIOXIDE (CI 77891), IRON OXIDES (CI 77491), YELLOW 5 LAKE (CI 19140), CARMINE (CI 75470), ALUMINUM POWDER (CI 77000). *CONTAINS CARMINE AS A COLOR ADDITIVE/CONTIENT DU CARMIN COMME ADDITIF DE COULEUR. Rose Quartz Metallic - INGREDIENTS/INGRÉDIENTS: MICA (CI 77019), ZINC STEARATE, OCTYLDODECYL STEAROYL STEARATE, HYDROGENATED POLYCYCLOPENTADIENE, CAPRYLIC/CAPRIC TRIGLYCERIDE, TALC, DIMETHICONE, HYDROGENATED PALM KERNEL GLYCERIDES, ISODODECANE, CAPRYLYL GLYCOL, ETHYLHEXYLGLYCERIN, HYDROGENATED PALM GLYCERIDES, TIN OXIDE, CALCIUM ALUMINUM BOROSILICATE, TOCOPHEROL, CALCIUM SODIUM BOROSILICATE, SILICA. (+/-) TITANIUM DIOXIDE (CI 77891), IRON OXIDES (CI 77491), ULTRAMARINES (CI 77007), CARMINE (CI 75470), FERRIC FERROCYANIDE (CI 77510), YELLOW 5 LAKE (CI 19140). *CONTAINS CARMINE AS A COLOR ADDITIVE./CONTIENT DU CARMIN COMME ADDITIF DE COULEUR. Rose Quartz Glitter - INGREDIENTS/INGRÉDIENTS: POLYETHYLENE TEREPHTHALATE, MICA (CI 77019), CALCIUM ALUMINUM BOROSILICATE, SQUALANE, POLYURETHANE-11, HYDROGENATED STYRENE/ISOPRENE COPOLYMER, CAPRYLYL GLYCOL, ETHYLHEXYLGLYCERIN, TIN OXIDE, GLASS BEADS, TALC, SYNTHETIC FLUORPHLOGOPITE, CALCIUM SODIUM BOROSILICATE, TOCOPHEROL, TRIS-BHT MESITYLENE, SILICA. (+/-) TITANIUM DIOXIDE (CI 77891), IRON OXIDES (CI 77491), CARMINE (CI 75470), ALUMINUM POWDER (CI 77000), FERRIC FERROCYANIDE (CI 77510). *CONTAINS CARMINE AS A COLOR ADDITIVE./CONTIENT DU CARMIN COMME ADDITIF DE COULEUR. With a finger or firm brush press onto the lids and blend edges. Wear individually or layered.